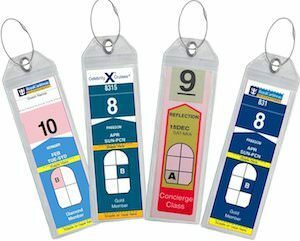 If you like to take a cruise then you know all about those long and narrow luggage tags they have to keep your luggage going to the right spot and how to you use those tags? Now there are these special luggage tag holder that are made for Royal Caribbean and Celebrity cruises. The luggage tag holders are made from see-through PVC and are strong and even have a closing system on the top so that the tags stay protected and secure as long as you want. And these cruise luggage tag holders come in sets of 4 or 8 so that you have enough for all your luggage. This entry was posted in Uncategorized and tagged cruise, luggage tag. Bookmark the permalink.